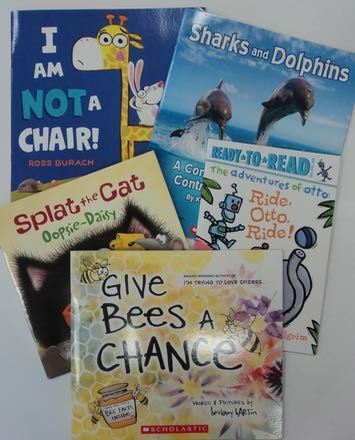 Which books to buy for our classroom? 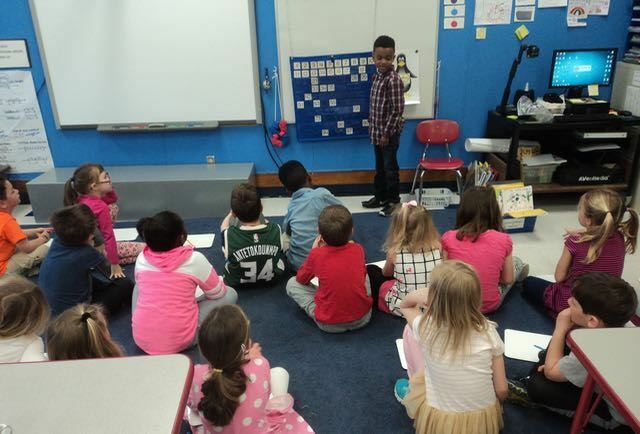 Students in Room 123 completed the final round of our Book Order Project, using math strategies to total the cost of the books they chose and persuasive writing to convince others to vote for their choices! 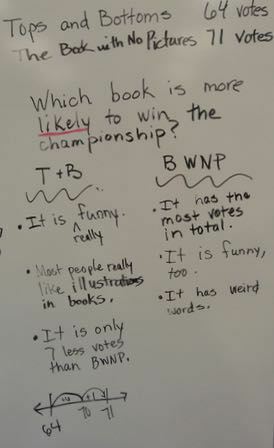 The tension mounted as students in Room 123 used tally marks to count the votes in the Championship Round of the Tournament of Books! First, Tops and Bottoms was ahead, then The Book With No Pictures nearly closed the gap. In the end,Tops and Bottoms won by one vote! 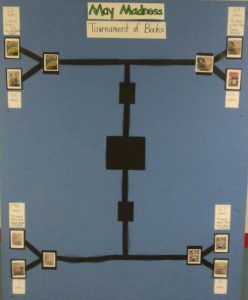 Two books have made it to the championship round of our Tournament of Books! Mathematicians in Room 123 analyzed the book statistics to make predictions about the final winner. First, they found the total number of votes each of the contenders had garnered through the earlier rounds. Next, they debated which book is most likely to win the championship. They used that data as well as other evidence to support their thinking. 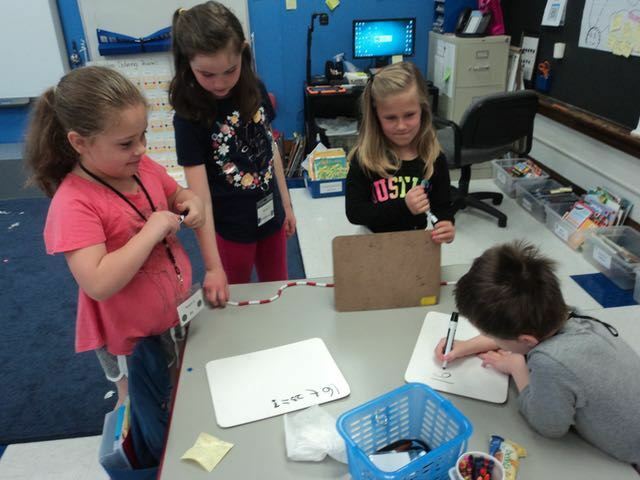 Finally, they weighed the evidence and shared their thinking. We’ll find out soon which book is the champion–watch for updates! 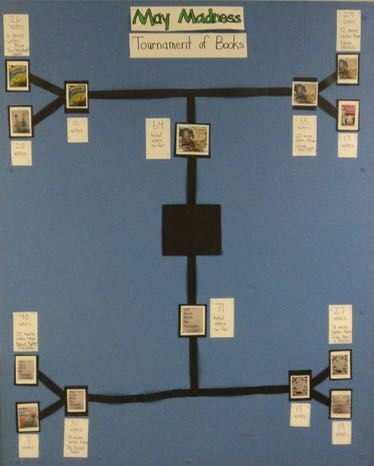 With the second round of voting in the Tournament of Books completed, mathematicians in Room 123 went to work! 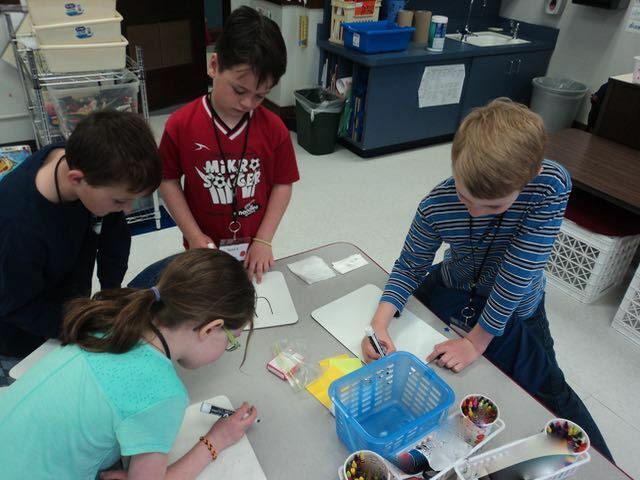 They counted ballots and found the winners. 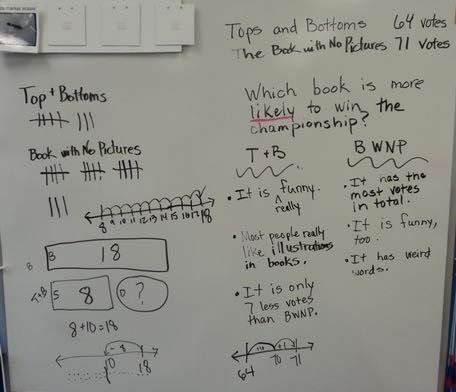 Then they used a variety of math strategies to find the difference in the number of votes between the winning books and the also-rans. 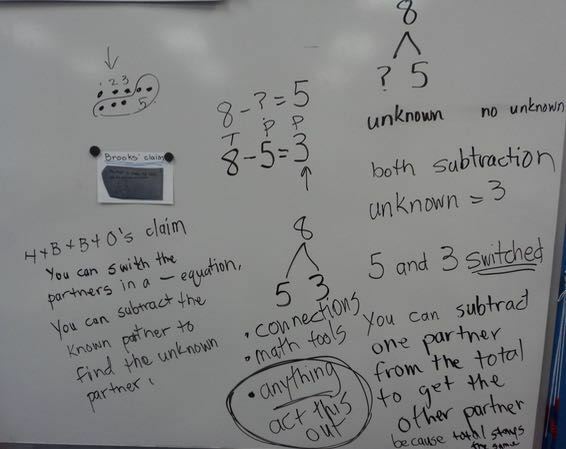 This type of math problem–a comparison problem–can be challenging for young mathematicians. Grounding the problem in a real-life context supports their thinking as well as increasing their engagement. 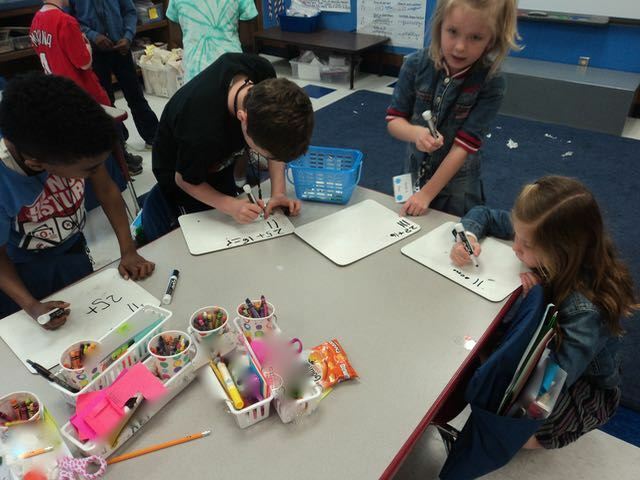 Mathematicians in Room 123 used what they know about tens and ones to place number cards on a grid. Then they had to explain why they placed the card where they did. When every student had a turn, I posed a question. Of course, simply counting the empty squares would be too easy. 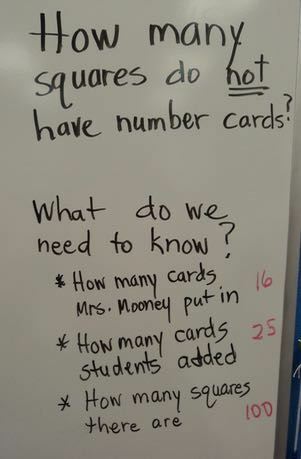 Instead, students worked in problem-solving teams to solve this question. They realized that they had to add the cards I had placed and the cards they had placed. Then, they had to determine how many blank squares were left. 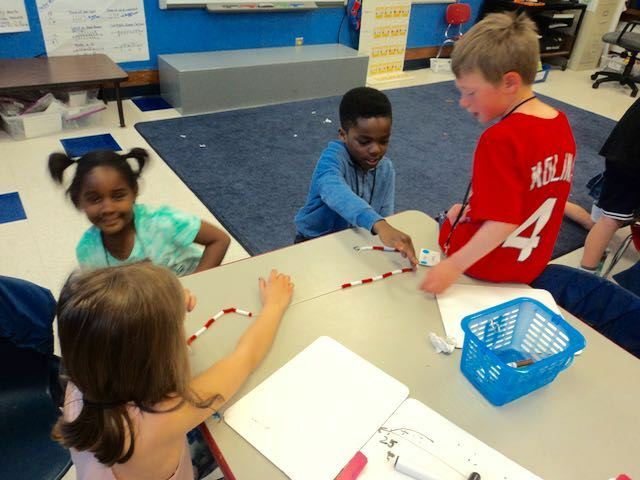 The teams used different strategies and math tools to solve the problem. 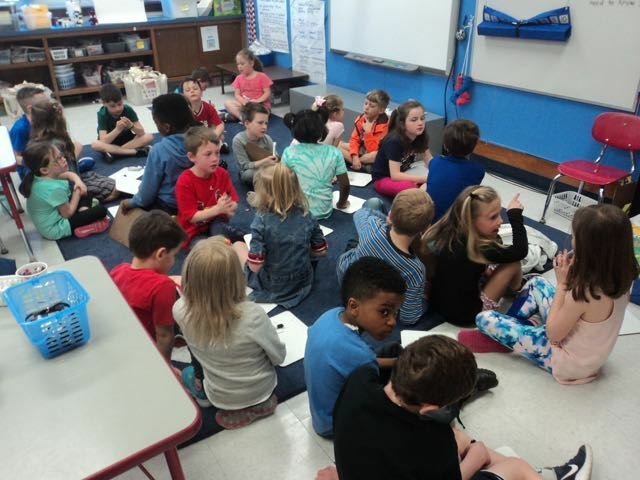 Then, they gathered to discuss their solutions! We need how many beads? 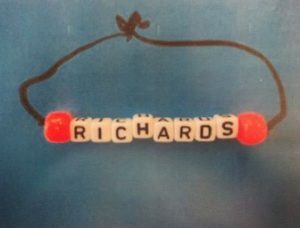 Mathematicians in Room 123 faced a challenge: how many beads would we need to order so that each student could make a bracelet like this? 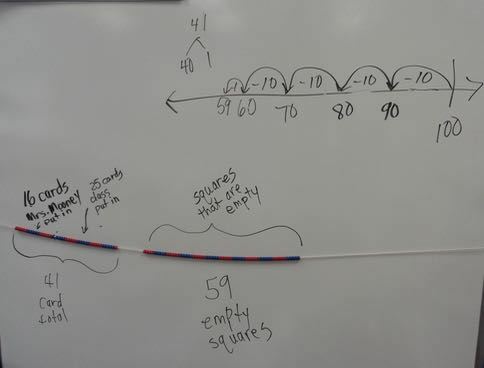 This problem provided students with opportunities for mathematical modeling of place value concepts. 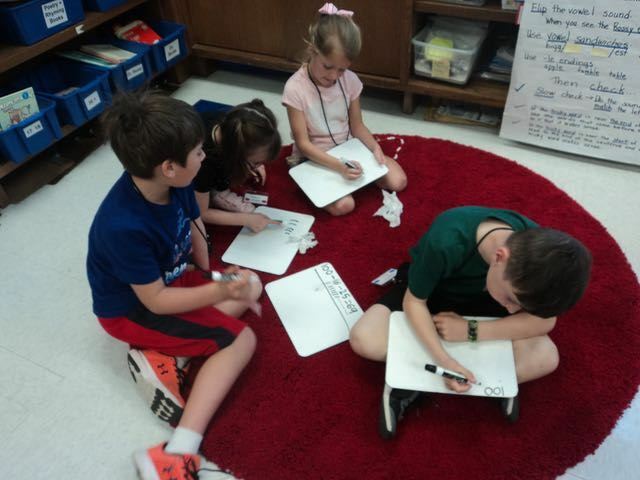 They worked in small groups to arrive at an answer and created posters to prove their thinking. Each poster had to clearly communicate the number of beads for each person and how many total beads. Take a look at their work! 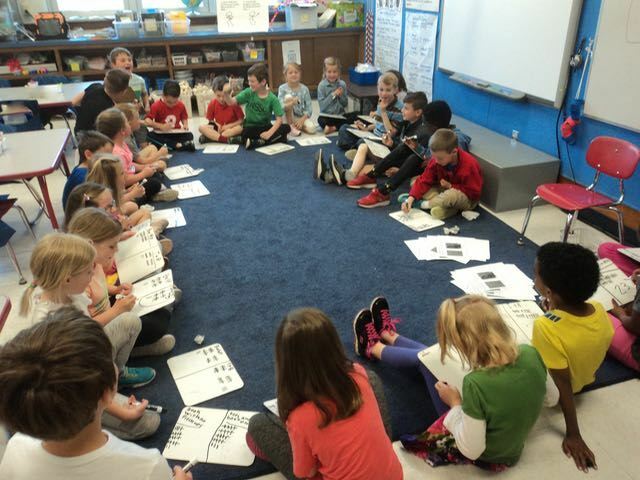 In Round 3 of the Book Order Project, students gathered to consider possible sets of books to order for our classroom. 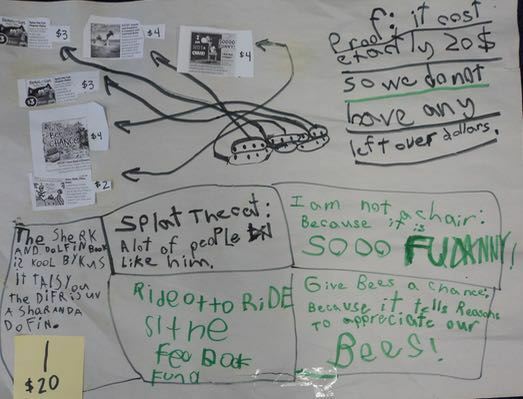 They had worked in teams to choose the books, used math strategies to prove how much the books cost, and added reasons to persuade their classmates to vote for their choices. 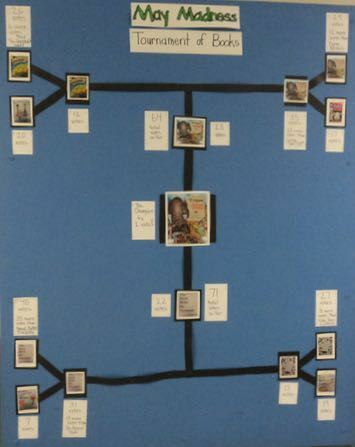 Students noted that the poster that earned the most votes had specific reasons why each book was a good choice. The books were ordered during Spring Break and arrived yesterday! 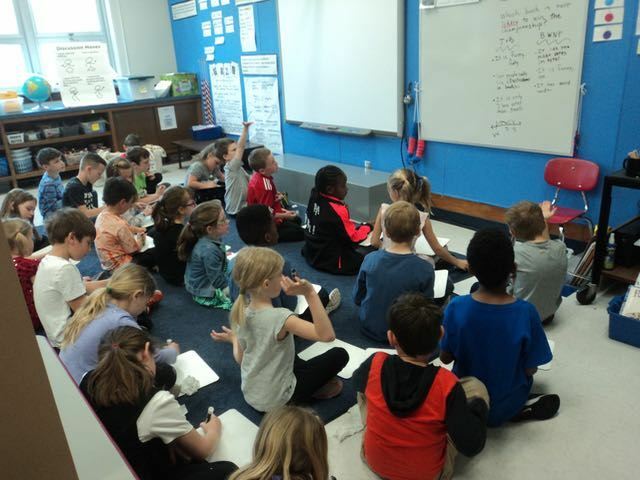 Mathematicians in Room 123 are learning to communicate their math thinking more clearly. 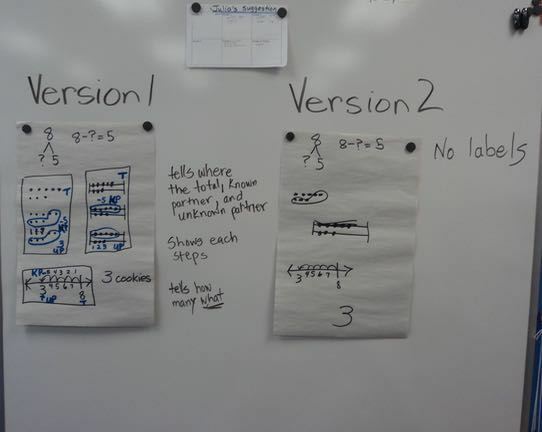 They compared two versions of a math thinking poster and identified key elements that helped the reader understand exactly what they did and why they did it. 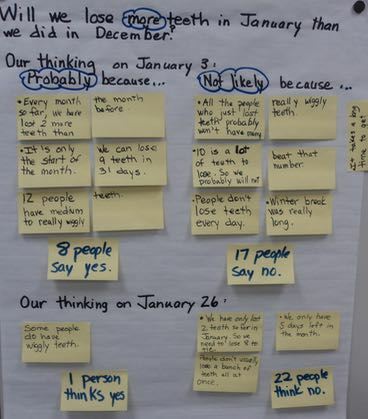 After working in teams to solve a challenging problem, the teams used a checklist to ensure they had shared their thinking clearly. You can see the process below! 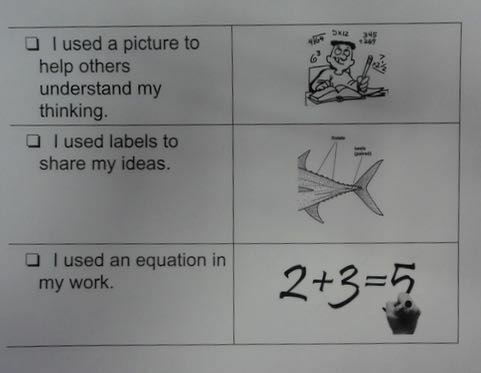 Mathematicians use a variety of models to understand problems and justify their thinking: equations, math mountains, stories, and objects. 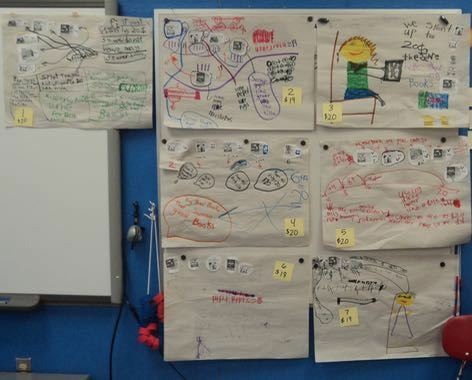 Below you can see how students in Room 123 used objects to prove how a mathematical claim works. 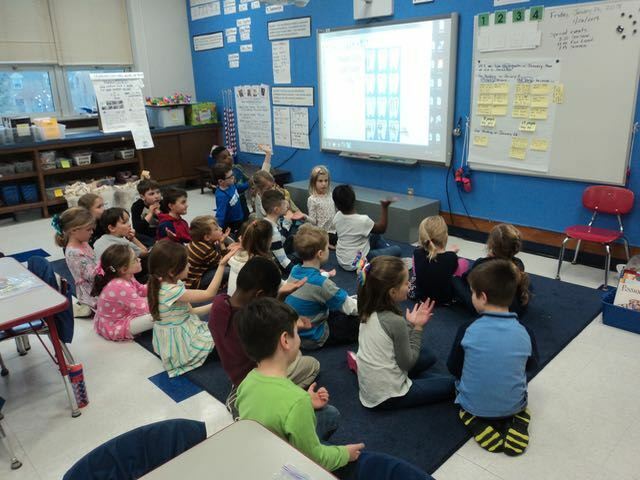 When Room 123 returned from Winter Break, students found that seven students had lost teeth over break! 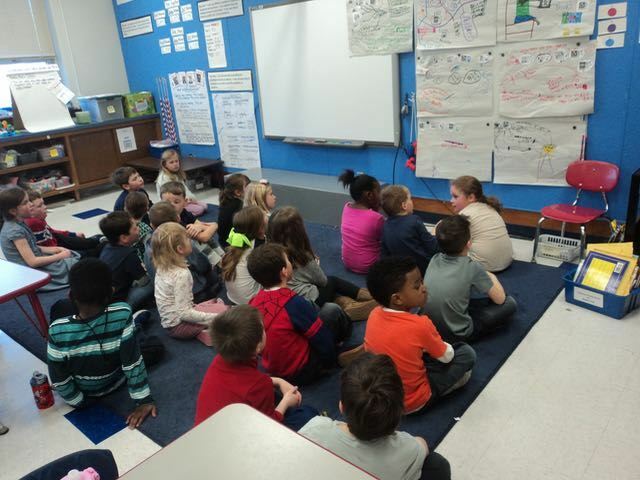 They immediately began wondering if the class would lose more teeth in January than in December. They discussed the evidence and took a position on this question. We returned to this question last week, near the end of the month. 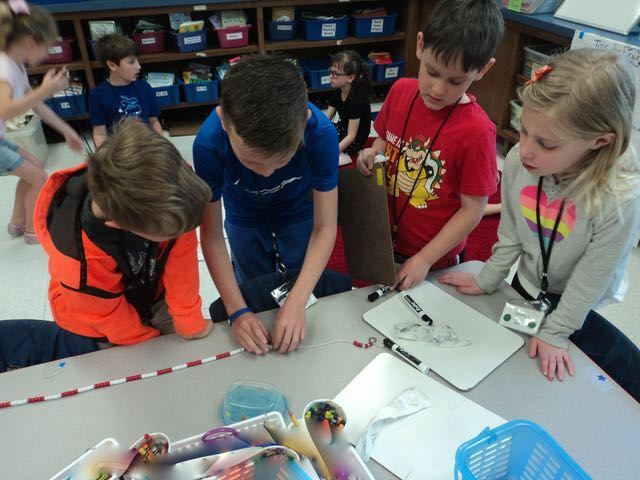 Students again discussed the evidence and weighed the evidence. 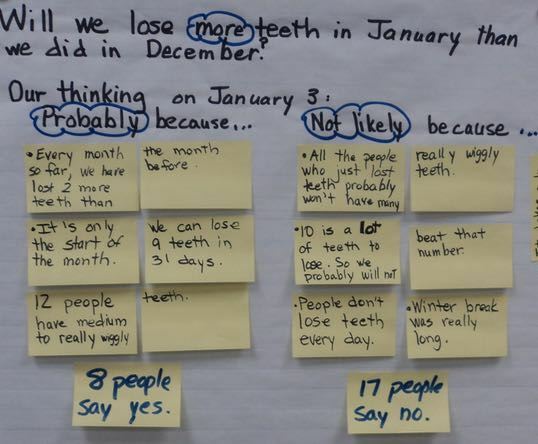 As a result, a number of students changed their thinking on the likelihood of losing more teeth in January. We’ll find out today if our revised predictions were correct!